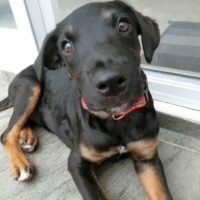 Klide was rescued from the street with his sister LeeLou by a local woman, Valerie. He is currently in foster with Valerie, so he is going to have a head start on his house training! Klide is a happy little man, normal activity level for a pup, and pretty laid back! He gets along well with dogs and people, and is all about cuddle time, and nap time. Klide is smaller than his sister, and it does not look like he is going to be a large dog. All the Dobie good looks, without the massive size!